I’m writing to you from a future you would never have imagined. A man tinged fake-orange, all bluster and bad hair sits churlishly atop the throne of the King of the World; but for how much longer? The foundations of democracy crack and crumble, supports are hauled in and the structure stands-but-does-not-stand; it is like a House of Cards so fleeting, impending collapse–inevitable. Dust rises from the rubble and it stings our eyes. Yet, even though our eyes might sting, we can see all too clearly. The rivers are dry; the fish are dead. The poor and disenfranchised huddle in cages, lashed by salty brine, lashed by sand, lashed by whips wielded by the hands of their fellow man. What will suffice? This world will do away with us. As we hurt her she will hurt us back. Already she withdraws, but not because we are killing her–oh no, to make that lofty affirmation would be to greatly overstate our abilities. She–the Earth–is far greater and more powerful than we will ever understand; and it is at HER bidding that the buildings tumble and fall, it is at HER bidding that the oceans rise. She has seen this all before. The Deluge lingers in the ice, eager and obsessed. It awaits the order to rush free and roar and drown mankind and all of our sorrows and woes. To punish us–again–for our collective wrongs. We cannot escape this fate, we cannot placate the Earth. Nor can we escape Her. We are bound here, it is a simple truth. This tiny orb as viewed from space cannot be defined: it is more than Earth or “Mother”, it is both of those things and more. It is fragile yet protected, surrounded by a thin bubble of atmosphere, swaddled by the star-lit brilliance of a Universe so, so far away. In the Arnold Schwarzenegger film Last Action Hero, the lines between reality and fiction are blurred as an archetypal “magic ticket” allows the characters to pop into (and out of) films themselves (for more on “popping in and out” of things read Godel, Escher and Bach). An Action Replay is a cheating device for computers and gaming consoles that wedged in-between the game and the machine and let you input codes that could grant invulnerability, the ability to walk through walls (we spoke of this unsacred power, called “no clip”, only in hushed tones) and whatever else you can think of. In a way, the Action Replay was like the magic ticket from Last Action Hero. The “real world” (this one) has plenty of rules as well and we’re especially good at thinking up names for them, like “Common Law” and “The Laws of Thermodynamics” and “Thermomix Instruction Manual”. But here’s the thing: in movies the rules can be adjusted. Sometimes this rule-bending is embedded into the story itself. Other times the characters might have an innate awareness of “the rules” and thus be able to bend them to their advantage. Sometimes, as in Last Action Hero, there’s a magic ticket involved. In video games you can use an Action Replay or input a bunch of button presses on your controller, or, if you’re feeling especially brave, you can type”no_clip” into the console. What’s out there, beyond the darkness? Does one see Truth? The Face of God? Or merely more emptiness? Here, in “real life” the rules are much harder to break. But lordy, how we try. We build Large Hadron Colliders. We read self-help manuals. We gaze into crystals and and cast nets and cast runes and cast faces in bronze and cast “hot new talent” in “spectacular retellings of old family classics”. Each thing that we build is a ritual; every word that we speak is a spell. My intention is for this new ongoing column to be a sort of Action Replay for reality. Or, if you will, the… Last Action Replay. I’ll “pop into” (as it were) popular (and unpopular) culture–films, books, music, games, realistic papier–mâché animals and more, in order to examine the way in which all of these things reflect upon us, others and, indeed, upon the very nature of the universe that we inhabit. In an attempt to unpack such an idea I will first attempt to draw a parallel between the underrated classic Arnold Schwarzenegger film Last Action Hero and the Action Replay cheat code device. Because the Action Replay was kind of like the magic ticket from Last Action Hero. Think of a nail; like you’d hit with a hammer. Work as hard as you can to form that image in your mind. Contemplate the length–maybe one or two inches; and the metal it’s made from (iron, most likely). Hold it in your mind’s eye, and then: with your mind’s hands. Touch the point of the nail with the end of your finger and notice that it’s sharp enough to prick your skin. Bite down on it–feel the unyielding metal between your teeth. Imagine a nail; like you’d hit with a hammer. Focus on the simplicity of its shape. Ignore, for now, its purpose. Vanish it–then bring it back. Practice doing this, until it becomes second-nature. In the coming days and weeks and months, I want you to cast your mind back to the nail you’ve created. Touch it–turn it over between your fingers–conjure it up (again and again): make the nail as real as you possibly can. Think of a nail, like you’d hit with a hammer. Put it aside: but don’t forget about it. You’re going to need it, soon enough. George Michael is smiling, but his smile is one frozen–trapped–inside this snow globe of sadness. He sings of an eternal “last Christmas”, never clearly defined. Such is the way in which the song is dragged along by the arrow of time and comes to be about every Christmas. This Christmas exists only as suggestion; a promise that the woes of the last will not be repeated. This year, George sings, to save him from tears, he’ll give his heart to someone special. Last Christmas: I gave you my heart. The very next day: you gave it away. This year: to save me from tears. I’ll give it it to someone special. It would not be so bad perhaps, if we could believe him. Yet clearly he mourns for the love that was lost–the love of last Christmas. His determination to “give his heart to someone special”, rings hollow–the forgotten dream of a promise yet fulfilled. George is carrying presents. Creeping through the snow like some bronzed, idealised Father Christmas. The gifts are wrapped with ribbon and topped with bows, but they are mere props to enhance the illusion. The truth is: those presents are empty. Or, if they contain anything at all, perhaps it’s explosives with which he will seek to shatter the glass of the snow globe at last, to escape from this self-imposed purgatory, this seasonal time-loop of Christmas Cheer. George will not explode the presents: he cannot. Because he is only an image. And just like the static figures in a snow globe he will remain on the shelf, gathering dust, until another year passes and, again, it is taken out and shaken up (again) to remind us, forever to remind us, of “Last Christmas”. Before you is a building–once grand; long fallen into disrepair. The building, all stone and spires and crumbling dark brick, teeters here at the edge of everything. Ghosts swarm around the building, faces unrecognisable, speaking nonsense words. Perhaps you are one of them. Then: the great wooden doors groan as they open. Wood splinters and dust kicks up from the ground. Somewhere you can here the sound of a great metal chain unspooling. “Hello?” says a voice from out of the darkness. A light blooms–flickering torch light–and the interior of the building becomes visible. Thick red carpet lines the halls, paintings hang askew on the walls. Stone corridors lead off in all directions. The man is wearing a grey hoodie, tracksuit pants and sneakers. But he does not seem out of place here; in fact, it seems as though this is exactly where he belongs. He smiles and his eyes twinkle, although you also sense great sadness in them. He leads you down stone corridors, past paintings that show a variety of landscapes and faces. Some of the pictures only show splashes of colour. Others are blank. He leads you through a junk room, piled high with weapons and armour. He leads you through a basement that hums with electricity, past switchboards covered in blinking lights and television screens showing static. He leads you outside, across a helicopter landing pad and up a set of narrow stone stairs that wind around a tower. “Not far now,” he says as you follow up the stairs. At the top you find yourself in a small room. One of the walls has crumbled away, granting you a view of the uncanny, churning sky that surrounds this place. You open your mouth to ask a question but you have so many. A tiny speck of light has appeared on the horizon. The moment you set eyes upon it, it seems to grow brighter. It pulses, each time growing larger, every second growing drifting higher in the sky. The ball of light pierces through the clouds and shines down on your face. Behind it, the sky is blue. It is a sky that you recognise. 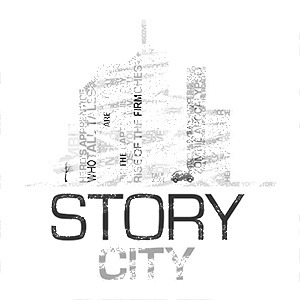 I have recently been fortunate enough to contribute to Story City: a project that uses a mobile app to combine text, narration, music and images to immerse readers in an interactive choose-your-own-adventure* style story that’s set in the real world. Wanting to be involved with the project was a no-brainer from the moment I first heard about it. The bookshelf above my head is packed full of game books I’ve been collecting since I was a kid. I always loved these types of books because of their ability to grant that elusive wish—to make the reader an active participant in the story. 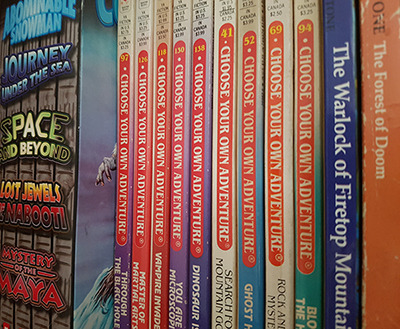 Story City is in an entirely different league to those old-fashioned game books. The app doesn’t only tell a story, but adds music, pictures and narration to create an experience; an interactive narrative in which the reader is at the centre. The story that I have written for Story City is a science-fiction espionage tale entitled, “The Firm”. My story has been woven into the very fabric of reality around some of my childhood haunts. It will linger there, invisibly, until you download the app. Not merely a story, but a part of the city. It is pioneering projects like Story City that are working to define the digital reality that is rapidly appearing all around us. A new sort of real estate has been created: an extra dimension in which we are limited only by our imaginations. Playgrounds can become satellite control-centres and historical buildings clandestine meeting spots. Tour guides can speak, digitally, into your headphones and explain to you the local history of a place as you explore it. It’s mind-bending if you think about it. It’s fantastic. And, perhaps most exciting thing of all is the fact that we’ve only just spotted the tip of a very large iceberg. We live in a time where magic is being breathed into the world, all around us, every day. Hand-held computers (that we still insist on calling ‘phones) are the magic wands with which this power may be conjured. I am thrilled, thanks to Story City, to have been given the opportunity to embellish the streets of Grange with a little magic of my own: conspiracies and ghost-trains are finally coming to life on the very streets where I first imagined them. Download the Story City app from Google Play or the Apple App Store to experience them for yourself, as soon as the story becomes available. * Other game books are available. We spend so long pretending that we are, or seeking to make ourselves, “whole” that we have been distracted from the truth—we come in pieces. From the cells in our bodies to the hairs on our heads, our thoughts and words and the hypocrisies to which we fall victim. From our first squealing breaths as we emerge into this world: attached to a cord, attached to a placenta, attached to a mother, from all of which we are detached. These are the pieces from which we are made. Our minds, no less, our knowledge, also comes in pieces. It is relayed to us as propaganda, education, opinion. We fill in the blanks, we assemble ourselves, we reassemble ourselves. We are the ultimate transformers. Even now, your cells are reforging themselves, dying and being reborn. On a school excursion, I once watched a scientist extracting DNA. She held up a tiny vial and used a pair of tweezers to tease a pale, viscous substance into the light so that the whole class could see. This is what you’re made of. Fig 1. Bearded Science Guy – DNA Extraction. Link. It’s nonsense, of course, but that’s not to say it isn’t true. And so, assuming that you are willing to accept the proposition that us living beings come in pieces, the next logical realisation is that so does everything else. The entire world is in pieces. The Universe. And as such, it quickly becomes self-evident that any concept of wholeness is a fiction. Why then this yearning, this constant search for togetherness? There are functional concerns to consider. A machine does not work without the union of its parts. And human beings are nothing if not spectacular machines. Our blood would not flow if not for our hearts and our hearts would not pump if it weren’t for our brains. An origami duck, unfolded, becomes a sheet of paper. A sheet of paper, laid flat, reveals a recipe for soup. And just like that—our yearning for wholeness—carries yet more subtle realisations, hidden between the folds. We know nothing of what existed before the Universe came into existence. But somehow, out of that murky, incomprehensible void something changed. Something… came together. Fig 2. NASA James Webb Space Telescope (JWST) Feature – Colliding Galaxies. Link. Out of that cosmogonic collision was a rapid exhalation, creating space and time and matter and, even, eventually… on a certain spinning rock, perhaps the most fantastic thing of all: an awareness with which it could perceive itself. diverse enough in its constituents to create life. In order to know itself the Universe had to separate itself. And we must do the same, no longer seeking wholeness—some entropic void in which to melt away—but by seeking to comprehend the disparate pieces from which all this has been assembled. We can do this by acknowledging the pieces that make up our world, and our lives. Firstly, we must accept that there is not one unifying truth but a multitude of complexities, patterns within patterns, cells composed of atoms composed of… strings? Perhaps vibrating to a tune we cannot hear: a cosmic symphony playing out in the explosions of stars and emotions. It is overwhelming to think that way. The weight of it is crushing. It is far easier to dispel the shades of grey and view things in black and white; life as a set of IKEA instructions, some paradoxical Escherian nightmare. Fig 3. 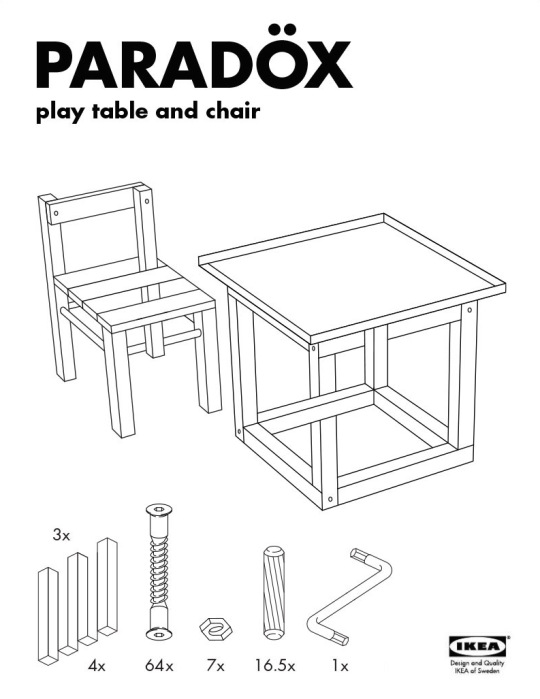 Escherian IKEA instructions. Source unknown. Instructions are useful. We cannot dissociate ourselves entirely from order. But we must steel our constant search for it against the fundamental understanding that we come in pieces. the idea that chaos exists at all. And if chaos exists, once we have built our Towers of Babel, everything is still—at its core—composed of chaos. A cake is not an egg, but it has eggs in it. In accepting this we come closer to understanding ourselves and our place in the Universe. Our imperfections define us, just as the undulations of gravitational waves reveal their existence to researchers. We must work towards smaller, achievable goals. We must ignore the picture on the front of the jigsaw box and instead focus on how the individual pieces fit together. We will get old this way. The years will slip past and, one day, we may find ourselves at the communal table of a nursing home and realise that the jigsaw laid out before us is still incomplete. Perhaps a few pieces are lost, or have simply fallen from the table. Sometimes, a passer-by, a stranger, an acquaintance, a friend, will offer up one of these pieces as they pass. Invite them in for a closer look, because others are often uniquely capable of fitting things together where we could see no way forward. And even then as the shadows lengthen and the dinner bell rings, will we realise that there’s no pieces left—that the picture is whole. But it does not match the picture on the box. Sometimes, we’re left with a picture we did not expect; something that we have never seen before and could never have imagined. And it is in that moment, as we struggle to catch our breath, that we finally achieve the exact intention with which the Universe—and we—were created.